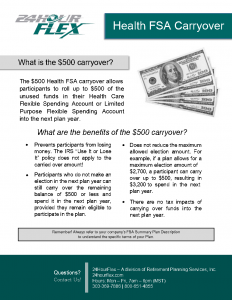 Some employers offer the option of a carryover with the Medical FSA. This provision allows you to carry over up to $500 in remaining FSA funds from one plan year to the next, minimizing the risk of losing money at the end of the plan year. By removing the “use it or lose it” risk from the Medical FSA, you have more of a reason to enroll — and re-enroll — each year. Happy saving! 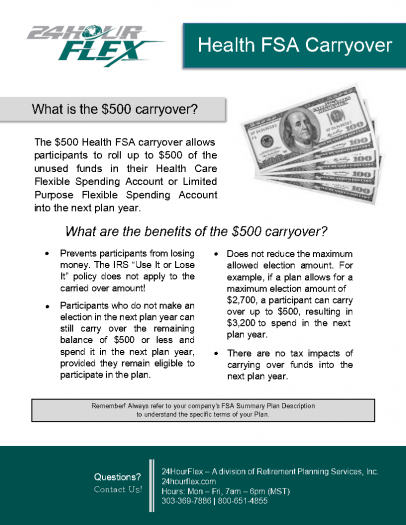 Not every employer offers the $500 carryover, so make sure to check with your Human Resource Department to confirm your specific plan details. When your plan year ends, any funds remaining in your Medical FSA up to $500 will automatically roll over to the new plan year. The amount that is carried over does not affect your ability to elect the maximum amount for your Medical FSA for the new plan year; any amount that carries over will simply be added to your new elected amount. For example, if I have $300 remaining in my Medical FSA at the end of my plan year, and I elect $2,700 for my new plan year, my carryover amount is added to my new election amount, giving me an available balance of $3,000. Even with the carryover, it is still important to plan your elections responsibly. If you have more than $500 remaining in your account at the end of the year — let’s say $700 — only up to $500 will roll over to the next plan year. The other $200 will be forfeited and go back to your employer. If your employer offers a run-out period for filing claims, you may be able to use up the $200 if you have expenses for which you still need to be reimbursed, but otherwise, still make sure you elect your best estimate of what you will use in a given plan year. If your employer offers a run-out period for filing claims at the end of your plan year, you can use your carryover funds and any remaining funds above $500 to be reimbursed for those expenses. If you don’t have any previous plan year expenses for which to file claims or if your employer does not offer a run-out period, your carryover funds can also be used in your new plan year for newly incurred services or products.